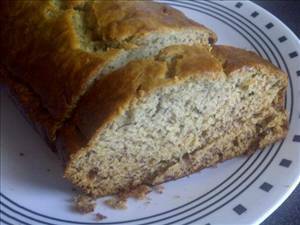 A yummy and simple banana bread that kids will love. Preheat oven to 350 °F (175 °C). Grease loaf pan. Add sugar, egg and vanilla. Stir well. Pour into loaf pan. Bake for 1 hour. Note: coconut or almond emulsions can be used instead of vanilla. Nuts and chocolate chips can also be added for a different flavor. 130 members have added this recipe to their cookbook. It was really easy to make, not much of a mess and it was delicious! There are 231 calories in 1 serving of Banana Bread IV. Calorie break-down: 26% fat, 68% carbs, 5% protein.